A couple months ago La Quadrature du Net opened a fundraising campaign. I appreciated that they placed a very easy to understand and very revealing version of their annual budget right on their main fundraising page. This should be feasible for arbitrarily large organizations, but to maintain the revealing feature, a drill-down page may be necessary. Sure, one can criticize the choice of chart, or that this is presented as a bitmap, but those are minor details. The information is useful and revealing, and I suspect being capable (operationally and politically) to provide useful and revealing info directly is a positive indicator of organizational health. Donors to organizations that claim to stand for anything like transparency should accept nothing less. “Executed” is perhaps the wrong word: such strong and personal calls speak to the organization and its constituency being very clear about what the organization is trying to do and how it is doing it. Without this clarity, it is basically impossible to achieve anything but muddled and weak messages, from the organization itself, nevermind its constituency. I don’t know how effectively LQDN’s constituency is helping it fundraise (I would not expect to, as it’d be mostly in French) nor do I know if Ada Initiative publishes any budget info (I didn’t look hard), but my point is to highlight how well each does on a particular aspect of fundraising, not to evaluate other aspects — though to repeat, I think getting either of these particular aspects right probably indicates a lot of other things are right. Copy rightness. The Futureof Copyright 2.0 contest has a winner, published with 8 other top entries. Read the anthology PDF/EPUB/MOBI ebook, listen to an audiobook version created by me reading each entry (for the purposes of judging) on sight aloud, or individual entries linked below in my review. “My mom and dad would get upset at me.” He sent her a copy of his anxiety. “My dad and I have trillions of books and thoughts, so we know better than you,” Helen said. “It would be bad if people stopped thinking,” Timothy said. An alternative bookshop in Sussex, on the other side of the world to Lucy, created a video ad with her favourite song as its backing track. The ad ended with a thanks to Lucy for releasing her music under a free, libre and open licence and a hyperlink. Hundreds more people visited her site, the passive consumers of big business! They used the donate button on her site to spray her with filthy lucre. [Socio-mathematics] was also the source of an unprecedented and fundamental agreement. All the stakeholders of the world came, after many unfortunate and even bloody events, to negotiate a new framework for producing and sharing common knowledge. And the basis they found was that to preserve freedom, but also the health of the whole planet and its species, that knowledge had to be shared, easily and readily, among all the stakeholders. That led to a rebuttal of so-called intellectual property and copyright laws and their replacement with a body of global law acknowledging our common heritage, codependent future and the fundamental right of knowledge everyone has. I hope that more people will have their own opinions instead of listening to the hissing of those snakes, sucking money out of artists to pay off their new automobiles. Wake up, folks, a good musician will earn his daily bread even if he decides to let his music go for free, for all to share. A poor man will be able to listen to real music, while a wealthy man will make the artist’s effort worthwhile. Isn’t it all about just that? Each may benefit, except the music companies which become redundant, so they turn to lies in order to keep themselves afloat. You see? An artist is a little like an art producer. But he deals with the genuine ideas, as you see. He doesn’t buy them, like the law says he should. He just comes to places like this and spends his time with them. It’s a slow process. No one knows why precisely, but this crazy little ideas are in love with him, well, with all the artists. Attempts to put digital rights management into 3D printers were sooner or later unsuccessful against hardware hackers. There were open sourced 3D printers but many perceived them to be inferior to the commercially patented ones. When the commercial 3D printers were used to make other printers most companies left the marketplace. This left many still infringing the 3D printers with the excuse that the printers became “abandonware”. That is now the object of companies’ manipulation. The file doesn’t contain a price, only points. In other words, the price is quoted in points. A point has a different monetary value for every country. Here, the minimum wage is about 1000 dollars. We divide the minimum wage by one thousand and receive the amount value of 1 point. If you download a movie, the server checks in which country you are, and converts the points into the appropriate price. That’s why in our times, pirates are at on the verge of extinction. Most frequently, they’re maniacs or followers of some strange ideologies. You can also read my review of last year’s future of copyright contest anthology, which links to each selection. This year’s selections are notably less dystopian and take less of a position on what the future of copyright ought be. I enjoyed judging this year’s contest, and hope it and any future iterations achieve much greater visibility. Current copyright debates seem to me to have an incredibly short-term focus, which can’t be for the good when changes which have supposedly produced the current debate are only speeding up. Additionally, and my one complaint about the contest other than lack of fame, is that “copyright” is a deeply suboptimal frame for thinking about its, and our, future. I will try to address this point directly soon, but some of it can be read from my contest entry of last year (other forms of info regulation with different policy goals being much more pertinent than quibbling over the appropriateness of the word “copyright”). Why would we build a “hyperloop” instead of just moving everyone in America to one huge city? We could fit basically the entire U.S. population into an area around 9,000 square miles (think New Hampshire) at the population density of Brooklyn (35,000 people per square mile), which is more than enough space for public parks and small (and even, for some, single-family) houses. A good, comprehensive public rapid-transit system could get you from one end of the city to the other in a couple hours at most. The rest of the country could be turned into national public wilderness and some large-scale industrialized agriculture. We could also eat bugs for protein and grow vegetable gardens. I don’t know how serious Read is, but why not, and why only “America”? All ought have access to the opportunity and wonder of The City — the opportunity and wonder of all humans. Though a serious part of me is serious about this, I know that only small progress is possible for now, perhaps until the em era. Thanks to Max Read for the fun comment, however intended. When we designed Lima, privacy was one of our main concerns. Lima stores your files at Home. So you can be sure you own your storage. Nobody in the world can access your data, but you. And you don’t need to pay monthly fees for that. The storage technology inside Lima was designed so you can get your data back anytime, even if your Lima device is broken. The security of your Lima device is our first priority. 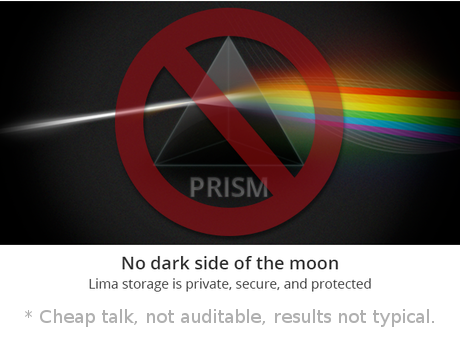 Like a private datacenter, your Lima is far more difficult to hack than your computer. Our team works continuously with security experts to make sure it remains so. Like high security servers, your Lima will be frequently updated with security patches to keep it unaccessible from badly intentioned governments and individuals. This looks like very great idea. I am definately a backer. I would like to know if there is any plan to open source the code (may be some kind of stretch goal) ? Whatever described as Tech FAQ’s looks great. But without open sourcing how one could be assured that there are no backdoors in the software. This is not matter of trust but it would be great if community can review the code and find out any security risks. Suraj, you are absolutely right. If I would be the NSA I would also create a kickstarter project and try to convince everybody that this project is the perfect anti-PRISM-tool and implement lots of backdoors and route traffic directly to the NSA. So, open source software is basically a must. But I don’t think that they can afford to make the SW open source because then you could use basically any similar device and don’t have to buy plug. @Suraj: Markus nailed it. We are too fragile as a startup to open source our code, at least now. All the innovation in Plug is software based. However, you’ll still be able to analyze Plug in/out traffic: that’s also a good way to make sure we don’t do bad things with your data. We don’t even handle the source code of the client! We tell you to go download that from Debian, Ubuntu, or https://Tahoe-LAFS.org. We can never see your data, and you can always see our code. Least Authority’s storage product is very different from Lima’s; but the above is excerpt ought be applicable to both as privacy-protecting products. Of course open source is no panacea for NSA compromise or any other security threat, rather a good practice that should be demanded for anything related to security. The only thing we manage on our side of the equations are updates of our app and the web interface of Lima. In case of company crash, we’ll do our best to open source at least the most critical parts of our code, so the community continues improving the solution every night. Cheap talk if there ever was. But I don’t blame the fundee, the company behind Lima; they are responding to what they see as business conditions, including lack of demand for software freedom (or open source, however you wish to characterize it) as a product feature that will change funding/purchase decisions. Similarly, it is a bit odd, and a bit of trivia, that today’s crowdfunding services are in part descendants of ideas focused on provisioning works without copyrestrictions, but it seems that with minor exceptions, if a project produces works that are both transparent (eg revealed source or design files) and not legally restricted, it is merely a happy coincidence. Again, I don’t blame the platforms or the fundees. I (perhaps with some hubris) assign blame to people who want there to be demand for freedom for failing to stoke it, and failing to organize what exists. Concentrated funders are very slowly making and coordinating their demands of fundees, eg Open Access mandates. How can crowdfunders/democratic patrons make analogous progress? Related: lack of demand coordination, libraries, and e-books, a narrow coordination idea that I need to follow up on, and classic background.